Relaxes the Mind and Body Cloud Walking Tea contains herbs that have traditionally been used to help eliminate those "should have, got to, need to, forgot to" thoughts that keep you awake. Relaxes the Mind and Body. 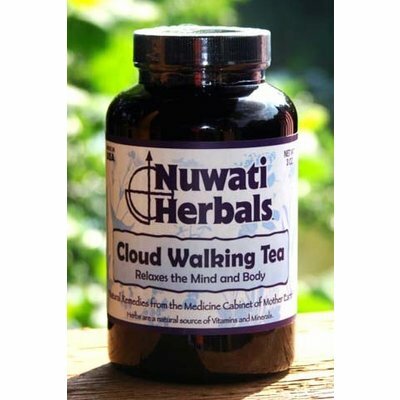 Cloud Walking Tea contains herbs that have traditionally been used to help eliminate those "should have, got to, need to, forgot to" thoughts that keep you awake. Also contains herbs that relax the body for a restful night's sleep. 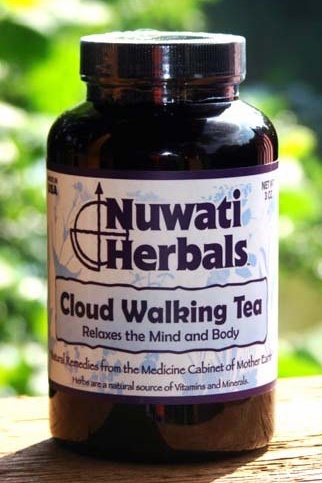 Cloud Walking Tea can be helpful to calm the nerves and anxiety attacks. Caution: Do not drink this tea and drive or operate heavy machinery, as it causes drowsiness. Ingredients: Catnip, Chamomile Flowers, Hops, Kava Kava, Lavender, Lemon Balm, Passion Flower, Rosemary, Skullcap, St. John's Wort, Valerian Root. Note: All Nuwati Herbals Teas can be effective hot, cold, room temperature, sweetened or unsweetened. It is just important to get the herbs into your body. Caution: Consult your health care professional prior to use if you are pregnant, nursing, take any medication or have a medical condition. As this product contains kava, consult your physician before use if you have or have had liver problems, frequently use alcoholic beverages or are taking any medication. Stop use and see a doctor if you develop symptoms that may signal liver problems (e.g., unexplained fatigue, abdominal pain, loss of appetite, fever, vomiting, dark urine, pale stools, yellow eyes or skin.) Not for use by personal under 10 years of age or by pregnant or breastfeeding women. Not for use with alcoholic beverages. Excessive use or use with products that cause drowsiness, may impair your ability to operation a vehicle or heaving equipment. Jar size is 2 ounce of herbal blend, which yields approximately 20 cups, or 4 ounce size is approximately 40 cups. BREWING: 1 tablespoon for every 8 oz (240ml) of 195°F (90°C) fresh water. Steep for 5 minutes or slightly longer to desired taste.